Knowledge : Furisode - KIDORAKU Japan - What a Kimonoful World! 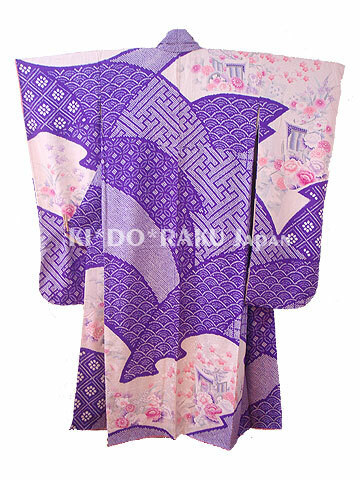 Furisode is a formal kimono with long length of sleeves. It is the most gorgeous kimono. like marriage ceremonies, coming-of-age ceremonies or graduation ceremonies. It's worn with luxurious Obi that has plenty of gold and silver thread. And the Obi is tied very intricate and deluxe. Sometimes, Furisode is used as costumes of Enka ballad singers too. Enka is a genre of Japanese popular song which is full of melancholy. Furisode is classified in length of sleeves. "Chu-Furisode (Medium-Furisode)" and "Ko-Furisode (Small-Furisode)". Each Furisode have different length sleeves. "Oh-Furisode" is called "Hon-Furisode" too. "Hon-Furisode" means "the most formal Furisode". and it's longest sleeves in kimono. lined double and padded the skirt with cotton. It's a little heavy to move with wearing it. Usually, it's used in only wedding scene or ceremony. "Chu-Furisode" is very common now. Most of Furisode sold in shops is "Chu-Furisode". The length of sleeves are around 100cm (91-106cm). sleeves of "Chu-Furisode" is becoming longer. It's as long as "Oh-Furisode". "Ko-Furisode" is not so common. But often, it's worn with "Hakama (a long pleated skirt/pants worn over kimono)". The length of sleeves are around 85cm (75-87cm). Moreover, there are "Kuro-Furisode (Black-Furisode)" and "Iro-Furisode (Color-Furisode)". It's depend on base color, and "Kuro-Furisode" is more formal. But, this rule is about to fade away.